Two years ago, my visit to Lapland in winter was magical. Everything about it was completely foreign to me, which made the trip that much more special. However, it could occasionally be limiting as well. My complete lack of experience with winter conditions meant that I didn’t trust myself to wander too far away from civilisation on my own. I was happy enough to go out to a hill in the middle of nowhere to watch the aurora, sure, but I was with a group of people that would probably have noticed if I’d disappeared into a snowdrift and hadn’t resurfaced. 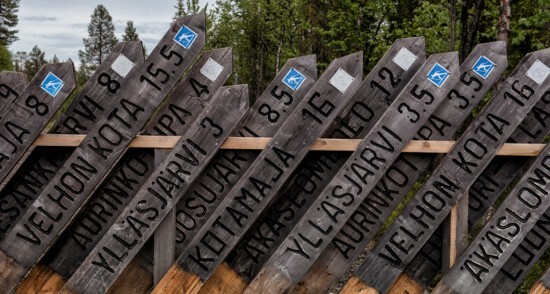 A fence made of old trail signs near Ylläsjärvi. So, when I returned to Lapland at the height of summer, one of my biggest goals was to explore beyond the towns, to really get out into the backcountry in a way I hadn’t done since my months of tramping across New Zealand. 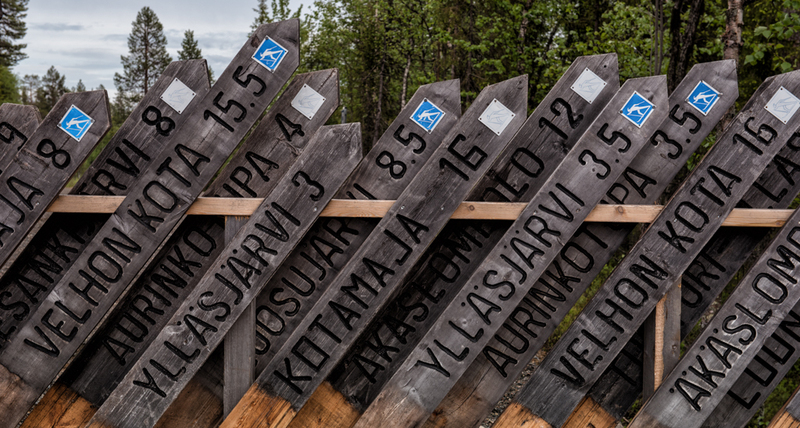 While I was able to achieve this goal in nearly everywhere I visited in Lapland, I found that Ylläs (pronounced oo-las) was especially well-suited for it. 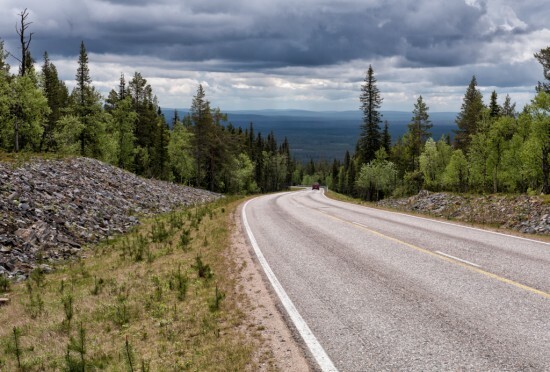 This area, located at the southern end of the Pallas-Yllästunturi National Park and composed of the two towns of Ylläsjärvi and Äkäslompolo, is best known as the ski resort that features the highest fell with ski lifts in Finland. Add to that 330km of cross-country skiing and you get a winter sports paradise. Driving between Äkäslompolo and Ylläsjärvi on the Ylläs Scenic Route. 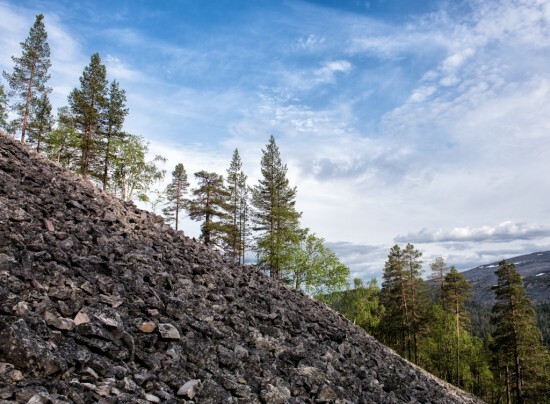 What’s less known, though, is that Ylläs is a summer sports paradise as well. 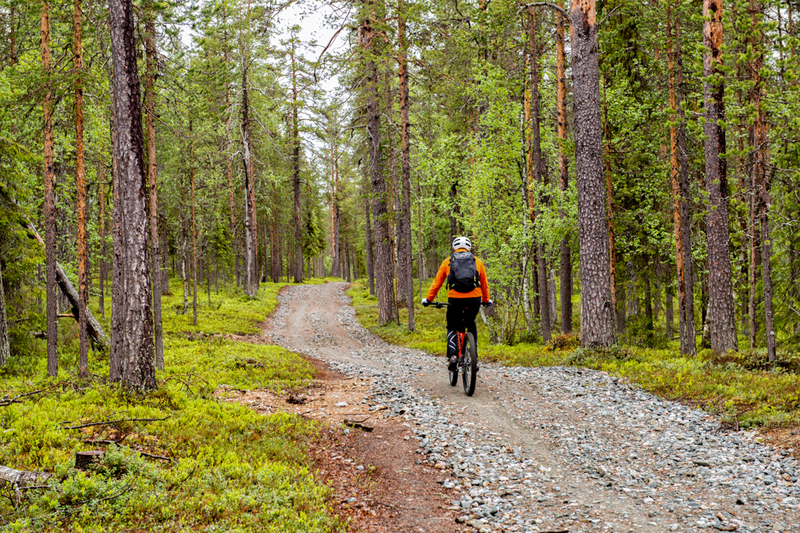 Trails criss-cross all the way through Pallas-Yllästunturi National Park, going over fells and around fresh, glassy lakes. You’re not just limited to hiking on those trails either; if you want to cover more ground (and feel the speed), you can go mountain biking, and if you want to get out on the water, there are plenty of canoes just waiting for you to get in and paddle away. 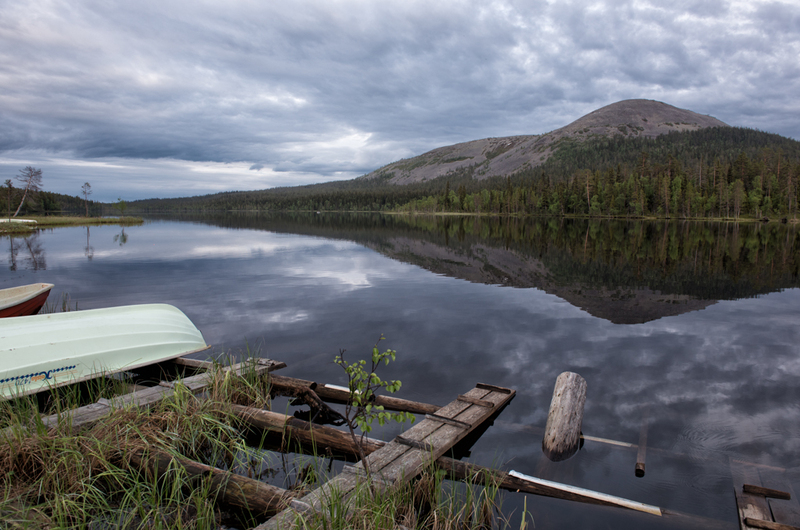 Lake Kesänkijärvi — a perfect place to paddle. The hut at Kesänkijärvi where we had tea and sausages. Before we began the trek up Pirunkuru, we stopped at a wooden hut next to Lake Kesänki. 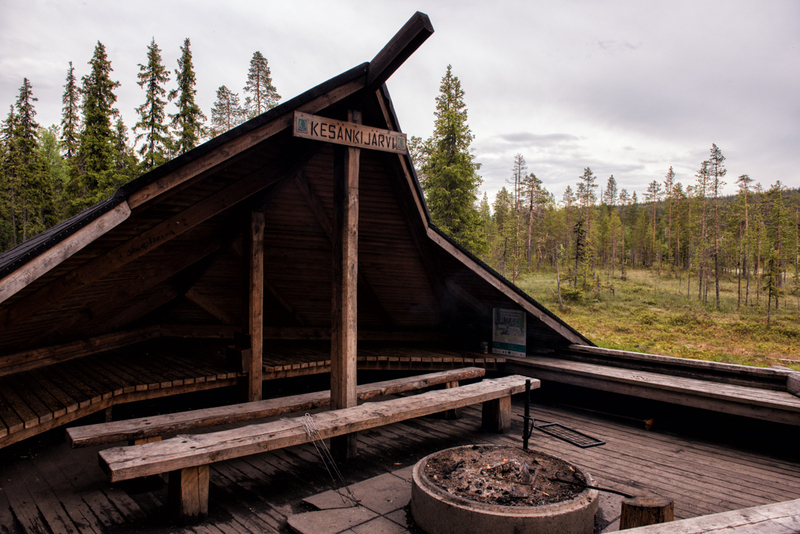 Like nearly all wilderness huts in Finland, it was equipped with a fire pit and well-stocked with chopped wood. And, like all the Finns I met, my hiking buddy Nina was just as well prepared, with a knife, a thermos of water, kuksas (traditional wooden mugs), and fat sausages (grillimakkara) — everything we needed for a warm cup of tea and dinner before the serious hiking began. We just had to be patient enough to not run away from the swarm of mosquitos while it all heated up! Looking down Pirunkuru towards Yllästunturi. Our stomachs full and our bodies warmed from the tea, we began the steep climb up the ‘damn gorge.’ It was almost immediately obvious where the name came from. As we scrambled over wobbly boulders up the centre of a deep ravine, the trees that lined the fell seemed miles above us. That said, it wasn’t difficult since the rocks provided plenty of hand and footholds, and I could look down at the drop behind me without my stomach turning into knots. It was just good old-fashioned hard work, and I really enjoyed it. The best thing about those hard climbs is the gratification you get from finally getting to the top. Kesänkitunturi was no different. Standing at 535m, we were a few hundred meters below the peak of Yllästunturi, which towered over Pirunkuru behind us. To the north, though, we could see for what seemed like hundreds of kilometres. In the muted light created by clouds hiding the midnight sun, the fells in the distance were differentiated only in their shade of blue as they rose one behind another. It was such a striking scene that it was hard to keep my eyes on the track as we made our way back down the other side of the fell. 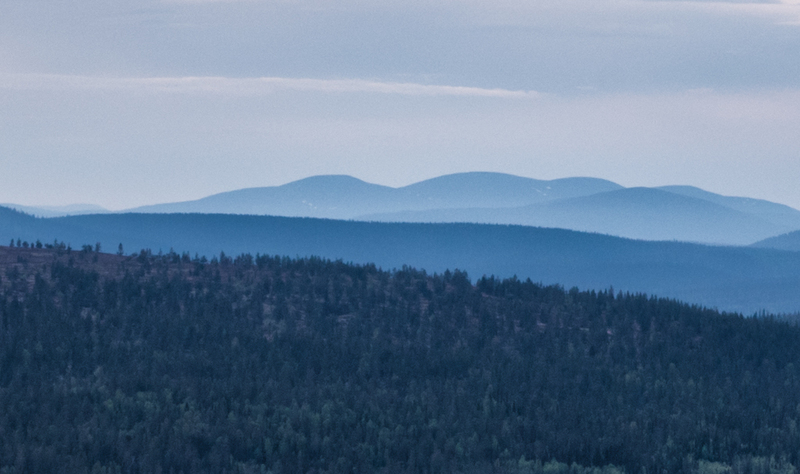 Looking north at the fells of Pallas-Yllästunturi National Park. The next day, I had the opposite problem — I struggled to take my eyes off the track. That’s because I found myself on a rented fatbike, something I hadn’t done since I’d ridden down the Kemijoki River in Rovaniemi two years prior. I’d forgotten how much more effort it took to turn a fatbike’s absurdly rotund tyres. While those tyres made the terrain significantly more forgiving, rolling over nearly any obstacle with hardly a wobble, I was also going so slowly that I had to keep my eyes glued to the track to make sure I didn’t get too close to the sides, lest my uncontrollable weaving leave me buried in the undergrowth. Antte biking through the national park. Luckily, I was under the expert guidance of Antte, a local policeman who had moved back after a few years in Helsinki because he missed the Lapland lifestyle. I appreciated both the fact that he was guiding me on his day off from the force and the fact that he wasn’t laughing at my total ineptitude. Eventually, I got the hang of it, and although my legs were burning, I loved being able to experience the trails from a different perspective. 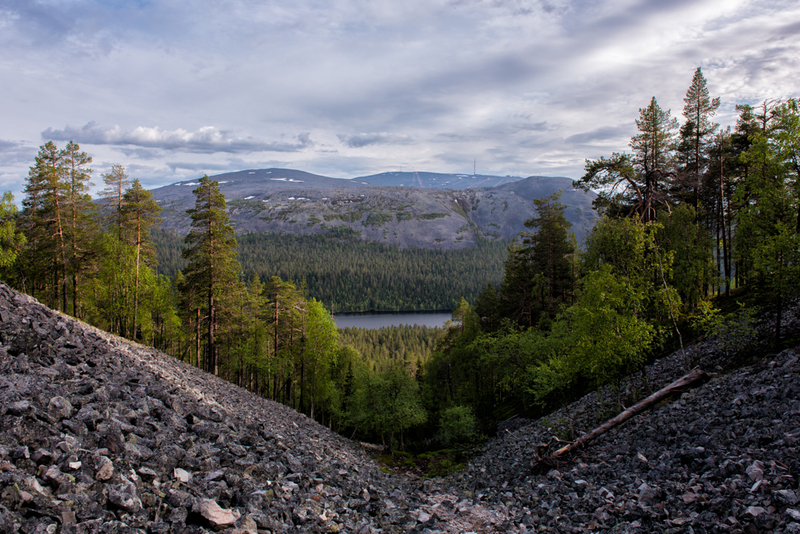 Plus, even though I was going at a snail’s pace, we were still covering more ground than we would have been able to on foot, meaning we were able to delve deeper into Pallas-Yllästunturi. Another national park trip, another lovely wilderness hut. We crossed over swamps, across rivers, and climbed up small hills, and we were surrounded by the brilliant green of a forest that knew it only had a few short months in which to grow, flower, and wilt before the winter was once again upon it. Only a few weeks prior to my visit, the deciduous trees had yet to sprout the first leaves of the season, but had I not been told that, I would have not have known. Only a few weeks after my visit, the berries would have begun to sprout — cloudberries in the swampy areas and blueberries carpeting the forest alongside the tracks. Knowing the trails as well as he did, Antte made sure to save the best for last. We peddled up to the top of a small hill that experienced mountain bikers would have laughed at, but I looked down in trepidation. He went first, plowing downhill and handling his bike masterfully. I followed, bouncing ungracefully between tree roots and rocky outcrops, somehow managing to keep my hands off the brakes. It was a huge rush and I couldn’t help but laugh. This was how the forest was supposed to be experienced — speed, adrenalin, and not an engine in sight. My stay in Ylläs was sponsored by Ylläs Marketing, but as always, all opinions stated here are my own. Thanks very much to both Nina and Antte for guiding me in Pallas-Yllästunturi National Park — it was so much better to have a local showing me around! 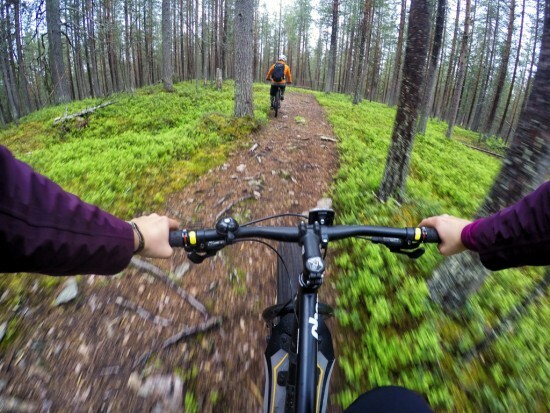 If you’d like to rent a fatbike for yourself, you can do so at Sportia Ylläs in Äkäslompolo. 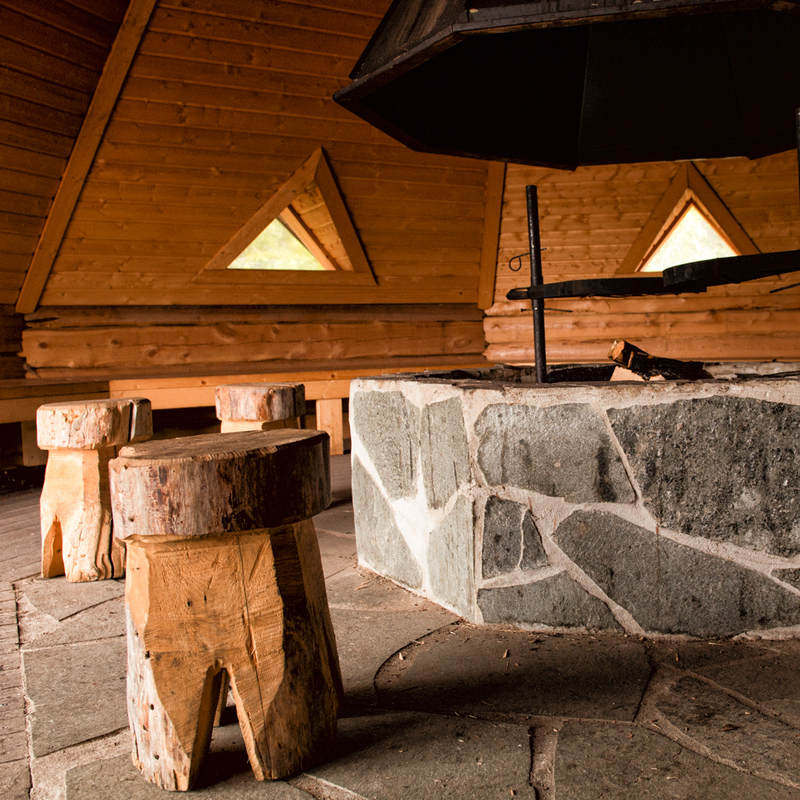 I also highly recommend staying at Lodge 67ºN when in Ylläs. It’s a small, comfortable lodge with great communal areas and the most welcoming, friendly owners. Standard twin rooms start at €65 and breakfast is included in your stay.